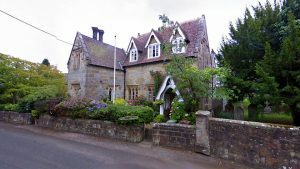 Viscount William Carr Beresford came to Bedgebury in 1837 and it did not take him long to become aware that children from his estate and nearby Kilndown village had to walk 2½miles to attend The National School in Goudhurst village. So he set about building an estate school at Bedgebury Cross at the point where the road to Kilndown meets the Goudhurst road. 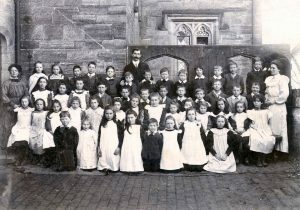 The school was designed to take fifty poor children, both boys and girls aged 3 to 10 years, in two schoolrooms at either side of the building and a residence for the schoolmaster in the centre. His wife, Lady Louisa, maintained the school. However, by 1841 the numbers of children attending the school had grown and it was unable to cope. In the same year Reverend Henry Harrison, the vicar at Christ Church, was looking for new premises for a Sunday school at Kilndown. He proposed that a new school be built close to Christ Church and set about applying for a grant from the National Society. A grant of £42 was made in 1842 but the plan for the new school did not proceed. In 1845 a new plan was initiated. Sophia Wykeham, Baroness Wenman who, as Lady of the Manor of Marden, owned land in Kilndown, donated a plot of land next to the church. In April 1845 Revd. Harrison wrote to the National Society asking for a copy of “suggestions or hints in preparing plans for the building of the schools and masters’ houses in union with the National Society”. An application dated 5 May 1845 refers to a population of one thousand and an estimated cost of £500, of which £300 had already been raised by subscription. The earlier grant of £42 would also go towards the cost. Construction of the new school began very soon after using stone quarried from the opposite side of Church Road. The school took a little over a year to build and, on St Batholomew’s Day, 24 August 1846, the Grand Opening took place. The opening was marked with a grand fête for the children and the poor of Kilndown. Food was served followed by sports for all. When the school opened the fee was twopence per child per week. Two log books were kept, one for the boys’ school and one for the girls’ school. An entry in the girls’ school log in 1876 records ‘Mercy Drawbridge sent home by H Harrison(Vicar) as mother refused to pay more than one penny a week”. In 1878 the fee was raised to threepence per week per child. Whether Mercy returned to school we do not know. In the 1800s there are several records of boys not attending school because they were employed “in the woods beating”. The 1880 Education Act had made education compulsory for all children between the ages of five and ten years. Poorer families depended on income their children could earn in this way but nonetheless it was against the law. In the boys’ school log book the headmaster attempts to bring this problem to the attention of the Schools’ Inspector with an entry that starts – “I wish to call the attention of the HMI to the great neglect of the Attendance Officer”.He explains the situation then continues ”.Appeal to the Keepers or threats of the law are simply useless owing to the neglect of the Attendance Officer. I beg most respectfully to enter my most earnest protest against such a state of affairs”. The problem was still in evidence at the turn of the century and by then the age of leaving school had risen to twelve years. Viscountess Beresford financially supported the running of the new school with an endowment. Following her death in 1851 in a codicil to her Will Lady Louisa instructed that a sum of £60 was to be paid to the Committee of Management of Kilndown School to be used for the annual salaries of the Master and Mistress, and a further £100 was to be paid annually to cover various running costs which she listed in detail. 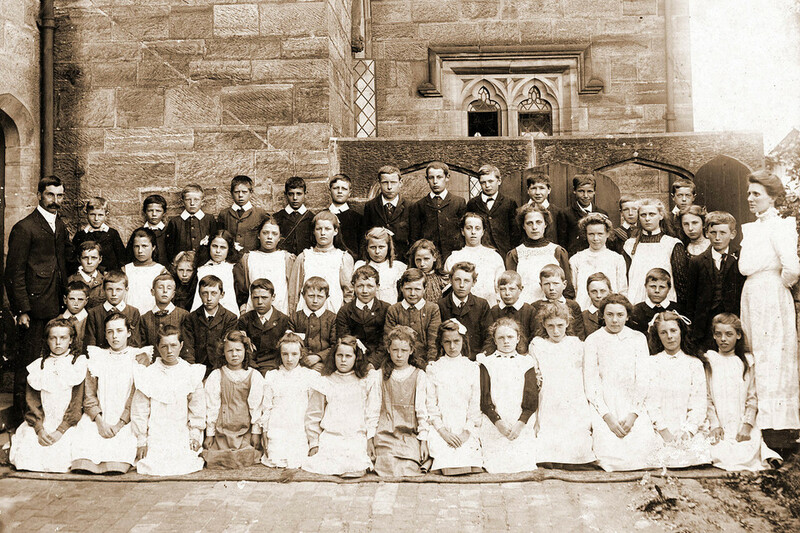 Kilndown School Group c. 1909/1910. As the building got older, maintenance problems appeared more often and the cost of repairs rose. One major improvement took place in August 1931 when Cranbrook and District Water Company laid on a mains water supply. In November 1937 the children from Riseden Infants’ School were transferred to Kilndown School. The school has been refurbished and new classrooms, a cloakroom and a playground had been added to accommodate the younger children. World War 2 also took its toll on the building and on the children’s lessons. In September 1939 a number of evacuees from Woolwich were taken into the school taking the school roll to well in excess of one hundred pupils. In October 1940 an air raid caused twenty-three windows to be blown in and three ceilings to become unsafe. A Kent Education Representative visited in December 1940 to find a suitable site to erect an air raid shelter for the school. In March 1943 bombs were falling in the distance and a lot of ‘activity’ was going on in the air above, including machine gun fire, so the children were evacuated to their air raid shelter. Attendance numbers were erratic during this period particularly in late summer when the children were called upon to help their farming families to bring in the harvest. On 17 June 1955 the school received a very special visitor, Mrs Irene Law. Mrs Law was the great granddaughter of the School’s founder, Lady Louisa Beresford, and a Trustee of the School. From the 1940s pupil numbers rose to as high as ninety children but started to fall again in the 1960s. In 1964 the Headmaster reported that there were sixty-five pupils and the school was full! But, within five years the numbers were down to fifty-six and in 1978 they had fallen to forty-seven. In the following years that number would fall further still to just twenty-two, the lowest in the school’s history. In 1990 the ‘Localism Act’ meant that schools became responsible for their own budget, a sum allocated to them by central government. From this budget they had to pay staffing costs, running costs, maintenance costs and much more. The age and poor condition of the Kilndown School building was of major concern and would seriously impact on their budget. Prior to the Act coming into force meetings had been held between various parties with a level of responsibility for the school including the Headmasters of Kilndown School, David Denton, and Goudhurst School, Anthony Rodney Phillips. They discussed the possible amalgamation of Kilndown School with Goudhurst School creating one school to be called the Goudhurst and Kilndown Church of England Primary School. Kilndown School closed on 31 July 1991 with just twenty-seven pupils. During the years following the amalgamation pupil numbers at Goudhurst and Kilndown School swelled dramatically. There was now a pressing need for a new and bigger building. After seven years a new school was built in Cranbrook Road, Goudhurst and it was opened on 1 September 1998. The school is still named Goudhurst and Kilndown Church of England Primary School and present day pupil numbers are in excess of two hundred.